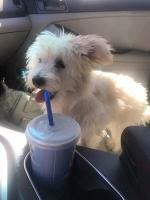 Jovie is an 11 month old female Maltipoo dog. She is very sweet and loving. She is smart and can do tricks. She prances when she walks, like a proud little pup. She is playful and curious. She loves to dig in the dirt and chase squirrels. She gets a lot of baths. My Maltese Poodle mix doesn't care for baths to much but she lets me groom her all the time. One of my favorite things about her is she loves to sleep on her back with her legs and paws up in the air. It's so funny. She lays on her back and looks at you up side down with her toy or chew stick hanging out of her mouth. She's very special. 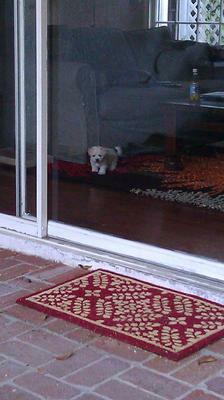 My Maltipoo puppy doesn't like loud sounds. Oh and lastly, when she meets someone for the first time she will make snort sounds and show her bottom teeth almost like a smile. She's the best dog I've ever had and I love her! she is adorable! I have an older malti poo, sounds like a similar personality to your dog, enjoy her! 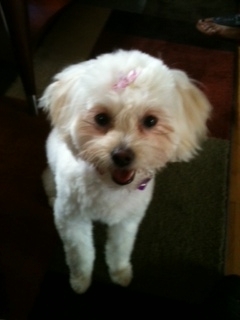 Molly is a loving intelligent female Maltipoo puppy she is 1 year old and is the sweetest puppy ever. I was never a dog lover but once I got Molly she won my heart loving and loves to cuddle. She was house trained very easily and also trained to go outside. She loves her early morning walk, loves to watch us get ready for work and as soon as she sees us ready she runs to her cage and wait for her treat, races my husband to his favorite spot on the couch, cutest think to watch. Our Maltese Poodle is the greatest addition to our family. At night before she goes down I would take her to her little puppy pad and say go potty and she would go before she goes to bed. Anyone guessing on whether to get a Maltipoo, go ahead you won't be disappointed. 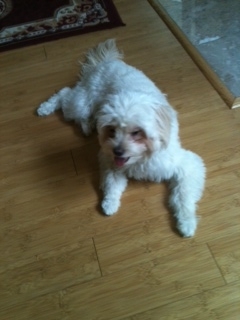 Lizzy is a 6 month old female Maltipoo and is 9 lbs and white. She loves to run and jump and she is very fast. 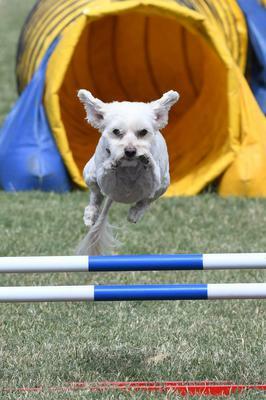 My Maltese Poodle can really jump with ease. She can jump up on a bed that is three feet high. She is very strong and will fight to get out of your grasp if held more than a minute. She shreds paper especially toilet paper and always seems able to find paper. My Maltipoo scratches and digs to find things. She loves to chew and playfully bites or chews on my hands or feet. She rings a bell to go outside but still makes mistakes. She is crate trained and does not get upset when we leave the house, but will lay in a spot and wait for us. 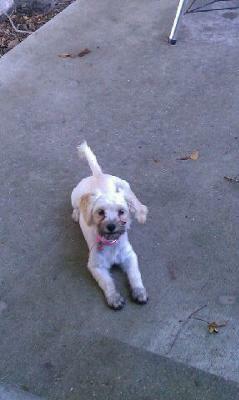 Sofia is a Multipoo or Maltese Poodle mix. She is just the sweetest and most intelligent dog in the world as far as I am concerned. She is actually my baby girl. I never thought having a dog would fill your life in such a wonderful way. Every day is a new learning experience for me, as well as for her. Sofie does just the cutest things, especially for her age, which is 6 months old. For example, one day she shredded some tissue all over the house, and I of course used my firm mommy voice as I term it and said, "Sofie, you bad girl you have shredded paper all over the house!" She hunched down and quickly disappeared. I went to look for her expecting her to be under a bed or something. Would you believe she actually was in her cage? Talk about intelligence, I use the cage for punishment purposes if she messes in the house or runs away when we go out side. But this little darling knew she had been naughty and decided to beat me to the quick as they say and put herself in the punishment cage. There are so many things that she does, that are like watching a child develop and grow. I can not envision her not being here today as a very big part of my life. As a new owner of a Multipoo, I strongly suggest if you are in the market for a pet her breed is a great one! i want a multipoo but my brothers alergies but ihear multipoos very rarely shed or havbe dandreff. is that true? My Poodle mix breeds dog Abigail is smart, fun, and good with kids. She is a good snuggler and likes to cuddle up! She loves to go to the park too. If we call her she will come! She is black with brown eyes. She Has pink collar too. 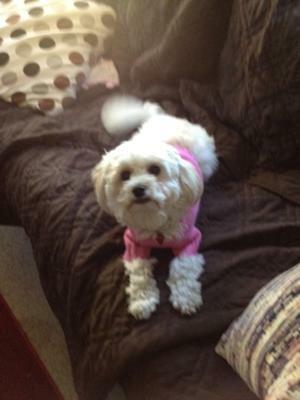 Zoey is a 4 year old energetic Maltipoo bundle of love. She has bursts of energy where she runs around the yard so quickly, she falls over on the turns. Yet at night she sleeps on her back with her little paws up in the air. She will remain asleep until we get up. When she was a tiny puppy we litter box trained her. However, now that she's a 'big girl," she likes to go out with our Malamute. Though she's a female, Zoey lifts her little back leg like a male. She's very quiet; not a yappy little dog that has a happy disposition. Her little tail is always going a mile a minute. Our Maltipoo has long silky white hair with a couple of peach patches... she's a sturdy 7 pounds with a round adorable face, coal black button nose, and very expressive eyes. She loves everyone, but is afraid of dogs other than our Malamute. Her one bad habit is that she will chew holes in anything made of cloth... the only toy that is safe for her is a heavy-duty nylabone. She will swallow stuffing from cloth toys, so she cannot have them. Though our Poodle Maltese mix is cuter than a plush toy, we respect her dogness and allow her to sniff, run, and chase critters in the backyard under our supervision. She loves to go for walks and car rides. While we work at our computer, she sits behind our backs in the chair. She does not like to be left alone. Exploring the living room at 7 weeks! My female Maltipoo puppy Little Lady is a dream come true! I love her so much:-) ! My Corgi Ziggy the Piggy had to be put to sleep last December '12, just a few days after Christmas. I'd had him since he was 6 weeks old. And he was one month shy of his 15th bday! I went 7 months without a dog in my life, and I couldn't take it!! I thought I wanted an already trained, adult dog, since I'm a renter and can't take chances on bad behavior and the countless potty accidents a puppy makes! Well the day before moving into a new apartment, my roomie to be tells me she has purchased a very young Maltipoo from a disgusting backyard breeder just to rescue the pup from the horrible conditions!! :-( She knew I was looking for a dog, but I wasn't really thinking I wanted a tiny dog, nor a puppy!! My roommate already has two dogs, so didn't intend on keeping her! Well lucky me, I saw my little girl and fell in love! Was already crate trained and using wee wee pads like a champ!!! I adopted my Maltese Poodle Phoebe via' Beverly Hills California as she was abandoned, she is so loyal and so teeny tiny & loving at 8 pounds. 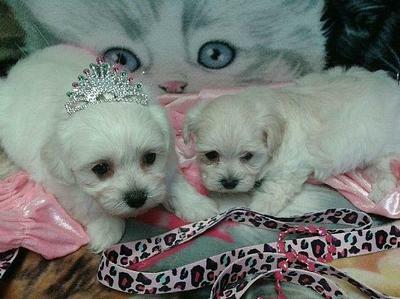 I have had my Maltipoo Atoosa since birth, she is 15 pounds (her parents > Mother 9 pound Toy Poodle & Father 7 pound Maltese, she is playful & so loving>>> yet very spoiled & hides under things if she doesn't get her way. 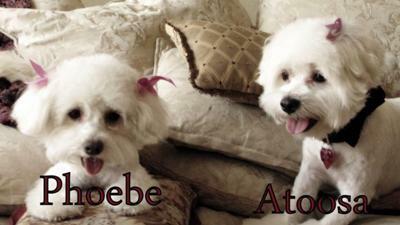 Phoebe & Atoosa were in a book for The Worlds Most Beautiful Dogs in 2010. 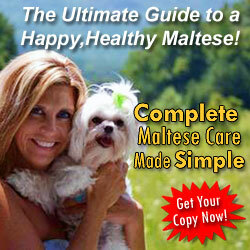 Lacey is a very special Maltapoo dog. My Maltese Poodle mix is very talented and always loves to have her belly rubbed. One thing a person should not mess with is her bone. She will chew it all day and night. Lacey also likes to play around a lot and catch toys. She seems to show her own personality like if the family does not follow a regular routine she'll make a mistake in her potty routine. She loves to eat chicken and just about anything she can find. Lacey is defiantly a people dog. My Maltapoo loves to be around people and that satisfies her for the most part. Whatever my Maltese Poodle mix dog Daisy wants.... Daisy gets! This little girl is loaded with Diva personality. Her likes: Surfing in the GMC Jimmy. Perimeter Patrols of her grounds. Hanging out with her people. Her box of squeeky toys. Treats! Cookies! more treats and.. being told "How pretty she is!" At thirteen years of age she is as playful as any pup could be. She naps as hard as she plays and really enjoys sleeping in on the weekends. In the mornings, she casually strolls out into the kitchen (last one up of course!) and lets us know she is now ready to go out for her morning perimeter check. "Oh Daisy, let me get the door for you." 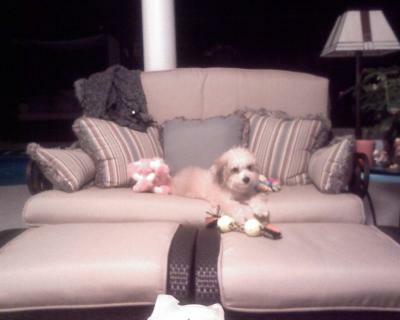 My Maltipoo is a wonderful housemate, all though I have to pick up her toys, she behaves inside without mistakes. Ever. After bathing, we place a nice large fluffy towel on the floor and she dries herself! Dropping nose first she scoots down one side of the towel, pushing herself with her back legs, reaches the end of the towel, stands up, and drops nose first on her other side and slides down the towel. Then she rolls over on her back and wriggles and rubs. One good shake and she is now ready to play. Its really quite comical. My Maltese Poodle mix dogs favorite quote, " Woo WOO!" So smart, so funny, Favorite healthy snack: Baby carrots with or without the Ranch dip. She likes almonds and peanuts, but not pistachios. I told you she's a Diva. Zoë is a wonderful little female Maltipoo dog. She weighs about 7 pounds, and is mainly black with white paws and a white tummy. She's extremely intelligent. When teaching her tricks like sit, stay, down, shake a paw, or wave, she got it basically immediately. She's just over 5 months, and we're still having trouble with house breaking her. 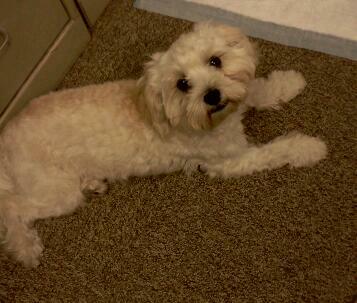 Some days my Maltipoo whines to go outside, but others she just goes on the floor. She is noticeably stubborn. Although she knows a whole bunch of tricks, she basically picks and chooses when she feels like doing them. I believe the stubborness is having a huge impact on the house breaking. When we're out on walks, she gets so excited when people or dogs walk by. She loves meeting new people/dogs. 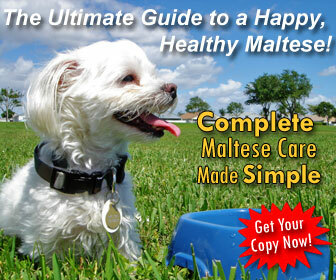 My Maltese Poodle actually starts to whine sometimes when someone wals by her without greeting her. She's also very good with children. Romping around with them has got to be one of her favourite things to do. As I've read about the breed, I've found that she's not near as 'calm' or generally relaxed as they are described to be. But in a way I'm thankful for that, because she's so entertaining. Overall , she's a just such a sweet, loving dog, and captures the hearts of anyone she comes in to contact with. Wouldn't trade her for anything in the world!